Rogue One: A Star Wars Story. 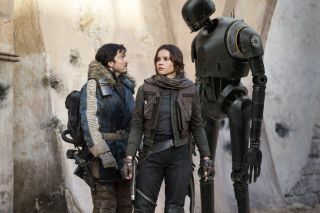 L to R: Cassian Andor (Diego Luna), Jyn Erso (Felicity Jones) and K-2SO (Alan Tudyk).. In just the opening minutes of "Rogue One: A Star Wars Story," director Gareth Edwards accomplishes the amazing and perhaps pragmatically necessary. In a whirlwind tour of several brand-new planets in a galaxy far, far away, he both unmistakably expands upon what may be the most familiar cinematic setting in movie history, and at the same time makes it plain this is not the old comfortable shoe version of "Star Wars" universe its legions of fans might expect, or even want. Initially embracing one "Star Wars" trapping but eschewing another, "Rogue One" instantly feels … different. While "Star Wars" buffs may search for common ground in the early moments, movie buffs in general should immediately recognize this is easily the most artfully and beautifully crafted entry in the franchise. The exterior settings feel both more real and more grand - just the establishing shots are more epic - and the camera pans, moves, and shoots from angles that purposely sets "Rogue One" apart from the rest. Even the exotic 'creatures' seem somehow more tangible, more dangerous. For true sci-fi aficionados, imagine what a "Star Wars" film might look and feel like if directed by Ridley Scott. Rogue One: A Star Wars Story..Stormtroopers. Edwards's vision is also different in tone - more mature and dare we say more 'gritty' than any "Star Wars" film before it, including last year’s highly successful though inarguably familiar "The Force Awakens." Less antiseptic than the very broad good vs. evil, dark vs. light fantasy-based conflicts of the series, the world of "Rogue One" is far more complicated, showing us a more realized version of a universe under the thumb of an evil dictatorship and the moral compromises soldiers living and fighting in a war zones might have to make. Some pundits have wondered if the public will fully embrace a "Star Wars" movie largely without Jedi Knights and main characters from the Skywalker lineage, and while that remains an open question in a commercial sense, "Rogue One" works best the freer it is from "Star Wars" iconography. If the film missteps even a little bit (and it’s probably better described as unnecessary steps), it’s the number of callbacks and touchstones to the original films it does manage to squeeze in. Some moments work better and more organically than others, while some seem a little forced and obligatory, momentarily distracting from the unfurling newness of it all. Edwards and screenwriters Chris Weitz and Tony Gilroy (based on a story by John Knoll and Gary Whitta) stake their ground the first time we meet rebel intelligence officer Captain Cassian Andor (Diego Luna), who out Han Solos Han Solo in his introductory scene. Luna represents near perfect "Star Wars" casting. To most moviegoers around the world he represents a brand new face and voice without distraction, but manages enough gravitas to the embody the morally-conflicted Andor well. Alan Tudyk as the voice of the often sarcastic droid K-2SO is easily the breakout character of the ensemble band of ‘rogues.’ Disney might be smart to try to find a future for him in upcoming films. Donnie Yen as the blind the Force-appreciator Chirrut Îmwe also stands out among the core cast. If any character actually gets short shrift its lead character Jyn Erso, played by Felicity Jones. Because a significant chunk of her life is missing from the film, moviegoers never really get to understand what makes her tick. She seems to morph from cold, calculating and disaffected to earnest, honest and heroic almost instantly, with only daddy-issues to explain the transformation. Jones is appealing enough and it’s a minor flaw in an otherwise superior product. We’ll find out in future years if Lucasfilm-Disney is pushing its luck with a new "Star Wars" film opening every year with new directors attached, but the formula it may have hit upon with "Rogue One" is as promising a start as there is. While the ‘Episodes’ can continue to deliver on the wants of longtime franchise fans every two years, the standalone movies can push the boundaries and refresh the cinematic palette every other year. Expect some debate to begin Friday as to where "Rogue One" stands in the hierarchy of the series. While it may not hit the nostalgic pleasure centers or be the emotional experience fans who have grown up on "Star Wars" may crave, it is clearly the most accomplished feat of filmmaking of the so-far eight. Removed from the expectations of my youth, it is hard to deny the accomplishment of "Rogue One."